Science Applications International Corp (NYSE:SAIC): Are Hedge Funds Right About This Stock? Most investors tend to think that hedge funds and other asset managers are worthless, as they cannot beat even simple index fund portfolios. In fact, most people expect hedge funds to compete with and outperform the bull market that we have witnessed over the past few years. However, hedge funds are generally partially hedged and aim at delivering attractive risk-adjusted returns rather than following the ups and downs of equity markets hoping that they will outperform the broader market. Our research shows that hedge funds do have great stock picking skills, so let’s take a glance at the smart money sentiment towards Science Applications International Corp (NYSE:SAIC). Science Applications International Corp (NYSE:SAIC) was in 24 hedge funds’ portfolios at the end of September. SAIC investors should pay attention to an increase in enthusiasm from smart money in recent months, as there were 17 hedge funds in our database with SAIC positions at the end of the previous quarter. Still, with all this enthusiasm Science Applications International Corp didn’t attract many of the wealthiest hedge fund managers (to see which stocks did take a look at the list of 30 most popular stocks among hedge funds in Q3 of 2018). In any case, to determine whether you should consider this stock for your portfolio we need more data, hence we will carefully analyze it further in this article. While collecting more data about Science Applications International Corp (NYSE:SAIC), we stumbled upon Horizon Kinetics’ 3rd Quarter Commentary, in which this employee owned investment manager talks about this company and recent changes of its business. “As to SAIC, very much like CACI, 62% of its revenues are from the Department of Defense, and over a third from other federal government agencies. For a flavor of the types of new or expanded programs SAIC is engaged in, it was recently awarded $1.4 billion for the Army’s Software Engineering Directorate, a $621 million contract for network and telecommunications support for the U.S. Central Command, and a $620 million engineering contract with NASA, for which SAIC is the leading provider of IT services. This is a company with $4.4 billion of sales for the year ended February 2018. Its backlog in February was 28% higher than in 2017. Now, it’s time to check out the fresh hedge fund action regarding Science Applications International Corp (NYSE:SAIC). How have hedgies been trading Science Applications International Corp (NYSE:SAIC)? At Q3’s end, a total of 24 of the hedge funds tracked by Insider Monkey were bullish on this stock, a change of 41% from the previous quarter. 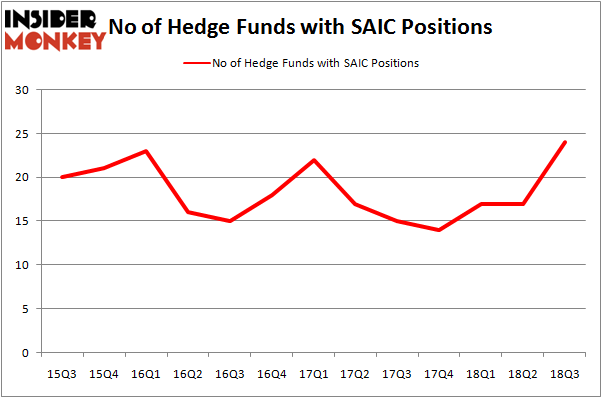 On the other hand, there were a total of 14 hedge funds with a bullish position in SAIC at the beginning of this year. So, let’s see which hedge funds were among the top holders of the stock and which hedge funds were making big moves. The largest stake in Science Applications International Corp (NYSE:SAIC) was held by AQR Capital Management, which reported holding $57.9 million worth of stock at the end of September. It was followed by Roystone Capital Partners with a $27.8 million position. Other investors bullish on the company included GLG Partners, Huber Capital Management, and Horizon Asset Management. As industrywide interest jumped, specific money managers were leading the bulls’ herd. Roystone Capital Partners, managed by Richard Barrera, assembled the biggest position in Science Applications International Corp (NYSE:SAIC). Roystone Capital Partners had $27.8 million invested in the company at the end of the quarter. Murray Stahl’s Horizon Asset Management also initiated a $17.8 million position during the quarter. The other funds with new positions in the stock are Paul Marshall and Ian Wace’s Marshall Wace LLP, Steve Pigott’s Fort Baker Capital Management, and Matthew Hulsizer’s PEAK6 Capital Management. Let’s also examine hedge fund activity in other stocks – not necessarily in the same industry as Science Applications International Corp (NYSE:SAIC) but similarly valued. We will take a look at Telephone & Data Systems, Inc. (NYSE:TDS), Syntel, Inc. (NASDAQ:SYNT), Box, Inc. (NYSE:BOX), and Chimera Investment Corporation (NYSE:CIM). This group of stocks’ market valuations are similar to SAIC’s market valuation. As you can see these stocks had an average of 19 hedge funds with bullish positions and the average amount invested in these stocks was $246 million. That figure was $186 million in SAIC’s case. Box, Inc. (NYSE:BOX) is the most popular stock in this table. On the other hand Chimera Investment Corporation (NYSE:CIM) is the least popular one with only 12 bullish hedge fund positions. Science Applications International Corp (NYSE:SAIC) is not the most popular stock in this group but hedge fund interest is still above average. This is a slightly positive signal but we’d rather spend our time researching stocks that hedge funds are piling on. In this regard BOX might be a better candidate to consider a long position. 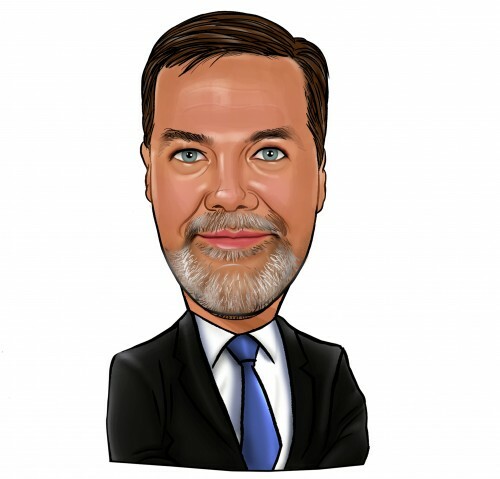 Hedge Funds Can’t Stop Buying salesforce.com, inc. (CRM) Wells Fargo & Co (WFC) vs. JPMorgan Chase & Co (JPM): Hedge Funds... Collegium Pharmaceutical, Inc. (NASDAQ:COLL): Are Hedge Funds Right About This... Electronic Arts Inc. (EA) Holds Off Activision Blizzard, Inc. (ATVI) to Remain... Hedge Funds Are Crazy About Biogen Inc. (NASDAQ:BIIB) Is OptiNose, Inc. (NASDAQ:OPTN) A Good Stock To Buy?